This Chart shows Clan Governance Index by Country. A clan is a group of people united by actual or perceived kinship and descent. Even if lineage details are unknown, clan members may be organized around a founding member or apical ancestor. The kinship-based bonds may be symbolical, whereby the clan shares a "stipulated" common ancestor that is a symbol of the clan's unity. When this "ancestor" is non-human, it is referred to as a totem, which is frequently an animal. The word clan is derived from clann meaning children or progeny but not family in the Irish language and Scottish Gaelic languages. Governance refers to "all of processes of governing, whether undertaken by a government, market or network, whether over a family, tribe, formal or informal organization or territory and whether through the laws, norms, power or language." It relates to "the processes of interaction and decision-making among the actors involved in a collective problem that lead to the creation, reinforcement, or reproduction of social norms and institutions. The governance indicators contribute to the growing empirical research of governance which have provided activists and reformers worldwide with advocacy tools for policy reform and monitoring. The indicators, and the underlying data behind them, are part of the current research and opinions that have reinforced the experiences and observations of reform-minded individuals in government, civil society, and the private sector, that good governance is key for development. 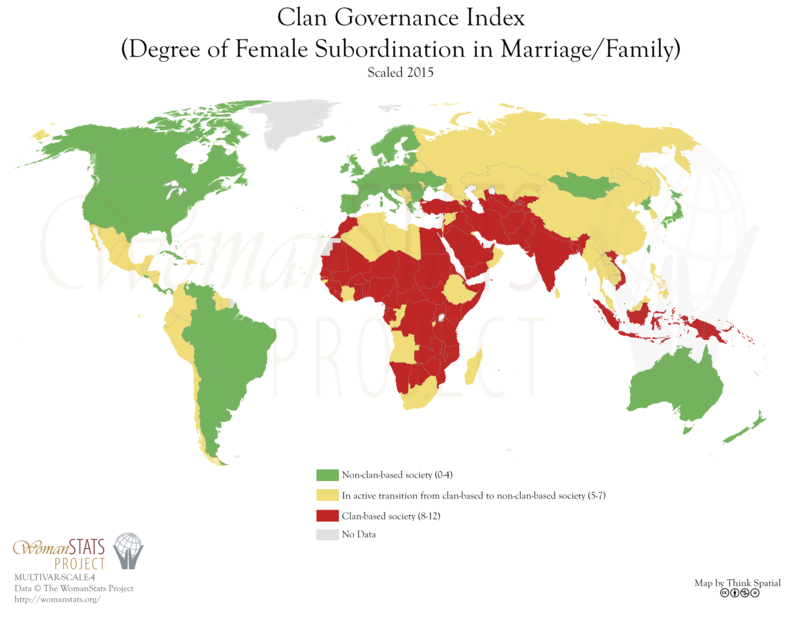 Clan Governance Index, Women's State Project, viewed 21st June, 2016, <http://www.womanstats.org/substatics/ClanGovernanceIndex_2correctstaticmiddle.png>. Clan Governance Index, ChartsBin.com, viewed 25th April, 2019, <http://chartsbin.com/view/41150>.